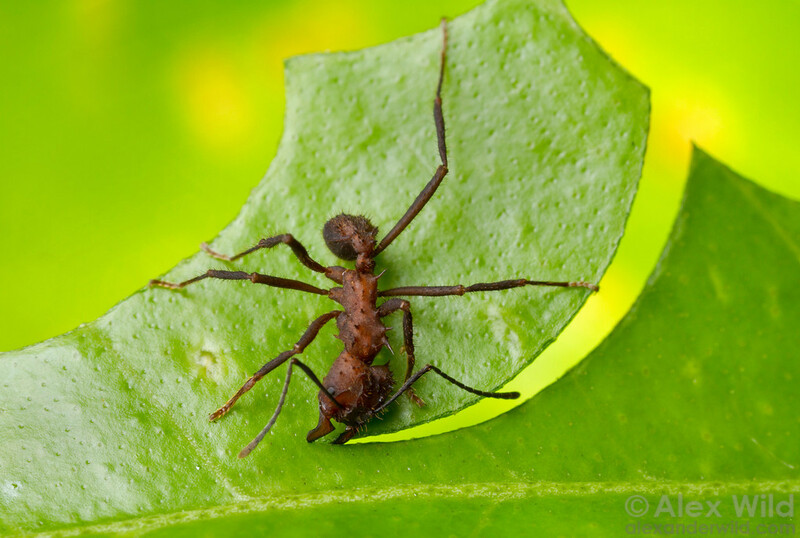 Last time we found out that the fungus of Leafcutter ants can be pretty weak against diseases. 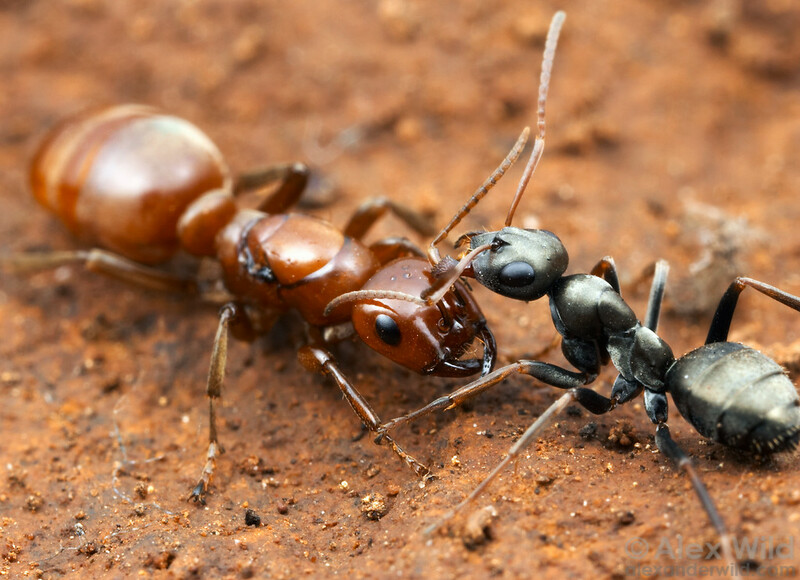 This can cause big problems for the ants, because they are completely dependent on the fungus for their food. 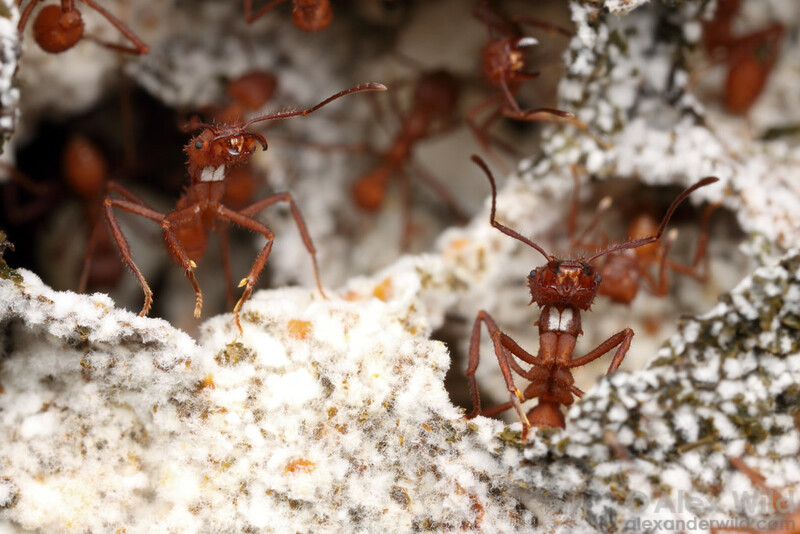 Unfortunately for them, a parasitic fungus called Escovopsis is all too willing to disrupt the peaceful collaboration between ants and their garden. This parasite is specialized in killing and eating the ant’s fungus. Bad news for the ants! However, by invoking the help of another organism, the ants are not completely defenseless against these attacks. If you look closely at the ‘chest’ (thorax) of many Leafcutter ant worker, it appears very white and dusty. This ‘dust’ are actual bacteria, living and growing in special pockets the ants have in their chest. These bacteria produce antibiotics in exchange for having a safe place to live. By transfering these antibiotics from their symbiotic bacteria to their infected fungus, they can kill the Escovopsis, and by doing so, save their colony from certain death. Thus, ants not only have agriculture like we do, but they also use pesticides to keep their crops out of harms’ way! Leafcutter ant (Acromyrmex echinatior) worker with white ‘dust’. Picture by Alexander Wild. Leaf-cutting ants, as their name implies, cut leaves. Instead of hunting or scavenging for prey, they actively cut leaves and bring them back to their nest. These leaves are processed by smaller workers, and incorporated in to the fungus they cultivate. Furthermore, they manure the fungus by defecating on it. In turn this fungus happily produces little edible structures called gongylidia, which the ants eat. Leaf-cutting ant cutting a leaf. Picture by Alex Wild. 2) If we grow only one crop, and a disease breaks out, we would be left without food. Number two is also very important for the ants. For them it would be great to grow different strains of fungus to prevent diseases from ruining their food-supply. However, the fungus doesn’t agree with this, as it also has its wants and needs, and it mostly wants to have as many offspring as possible. Therefore, it tries to secure its position and be the only fungus that the ants can cultivate! Leaf-cutting ants defending their fungus garden. Picture by Alex Wild. To do this, the fungus exploits the ants’ way of manuring. It adds compounds to its gongylidia, which do not get broken down in the gut of the ants when they eat them. These compounds remain present in the manure, and will attack any fungus except for the one that made them. Therefore, even if the ants would try to grow a new fungus by manuring it, they would actually kill it! This leaves the ants with only one fungus to cultivate. How do they prevent it from getting sick all the time? That will be the topic for next time! If you are a new slave-making ant queen, looking for a nest to enslave. How are you going to this? The problem is, ants can smell out almost any intruder, so getting into their fortress in order to take it over is not an easy task. Queens of the Amazon ant found a solution for this. Or actually, two solutions! First of all, they try to reduce their smelliness, which makes it harder for her potential slaves to recognize and kill her. However, this doesn’t always work, and she might still get attacked. What’s the solution to this? Chemical weaponry! An Amazon ant queen with an enslaved worker. Picture by Alex Wild. 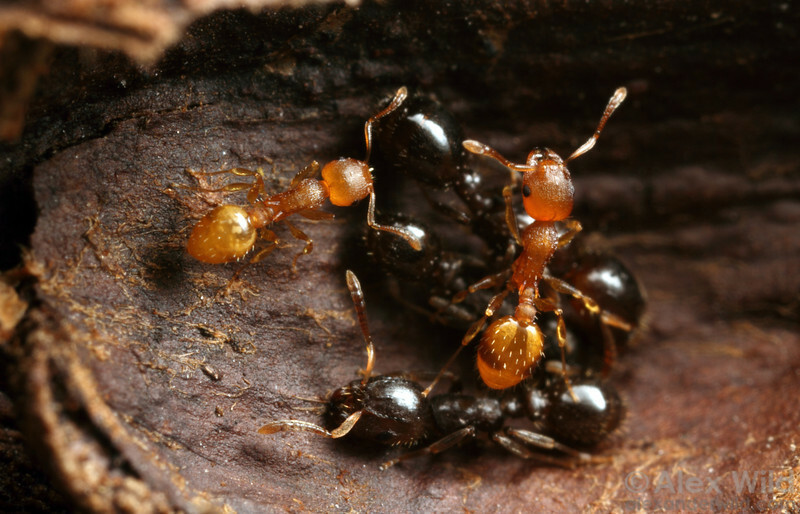 Amazon ant queens produce a certain kind of chemical that’s extremely repulsive to the ants she wants to enslave. Once she gets attacked, she can use this to repel the attackers. While the attackers are being busy being disgusted, the slave-making ant queen can try to find the queen of the nest she’s trying to enslave. Once found, she can kill that queen and take over the nest. While being in contact with the queen she’s killing, she absorbs the smell of said queen as well, and suddenly the slaves will not recognize her as an enemy anymore, but as their own queen. As we’ve established by now, some ant species enslave other ants. However, while for some species slavery is optional, other species completely depend on their slaves to survive. 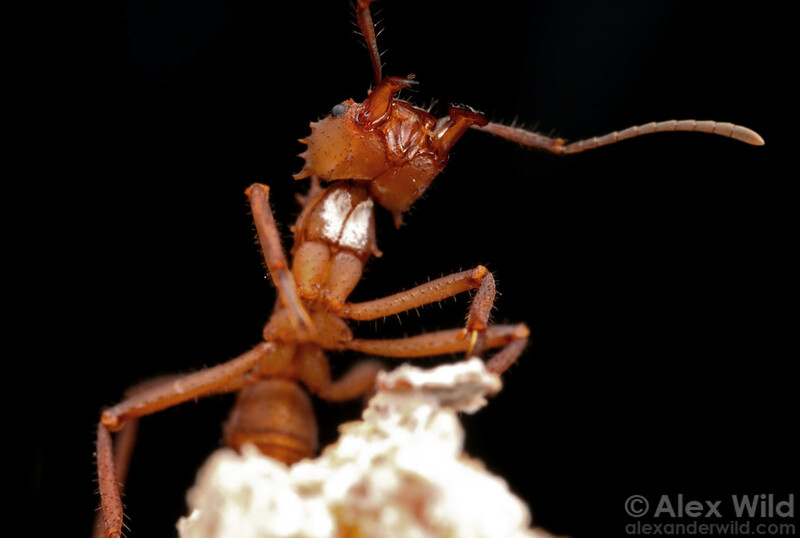 On first sight, Amazon ants look like any other ant. However, on closer inspection, you can see that their mouthparts look weird. 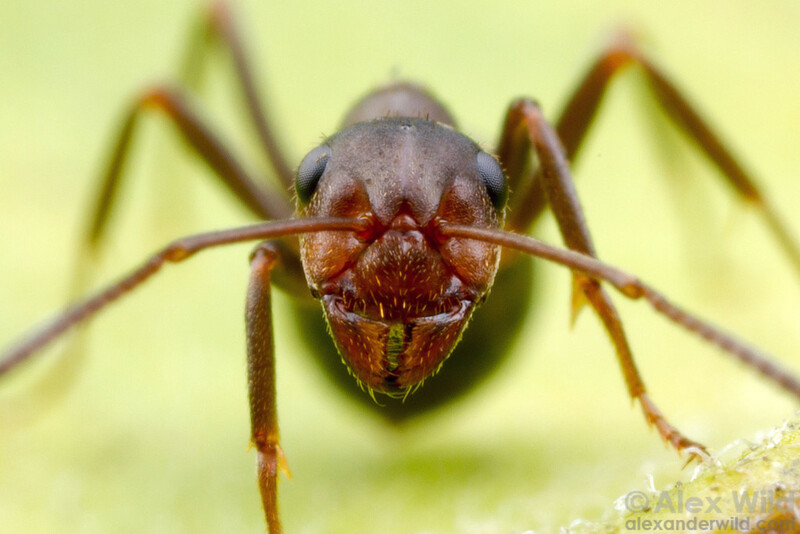 In the picture below, note how the slavemaker’s mandibles (left picture) are shaped completely different than that of a ‘normal’ wood ant (right picture). As you might guess, their mandibles are made for one thing and one thing only: grabbing and capturing slaves. While they are really good at this one thing (see picture below), having such a weird mouth prevents them from feeding themselves and taking care of their young. For this, they need slaves! It’s a vicious circle! 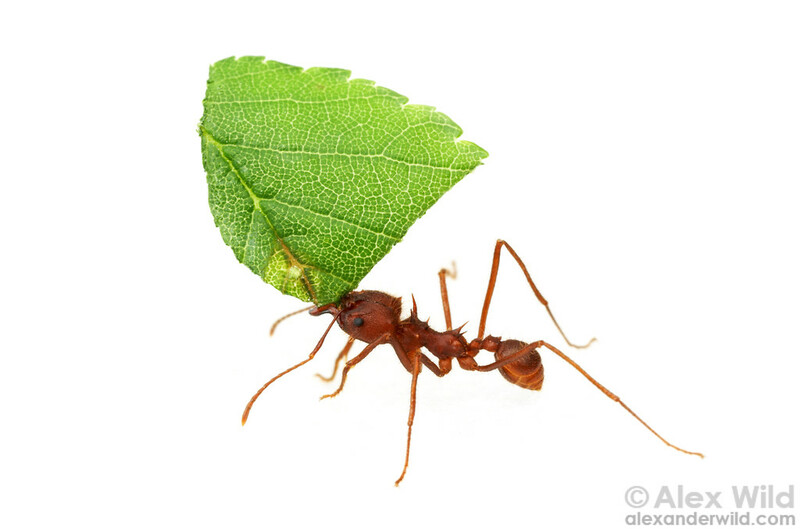 Polyergus ant carrying stealing a pupa, which will turn into a future slave. Picture by Alex Wild. 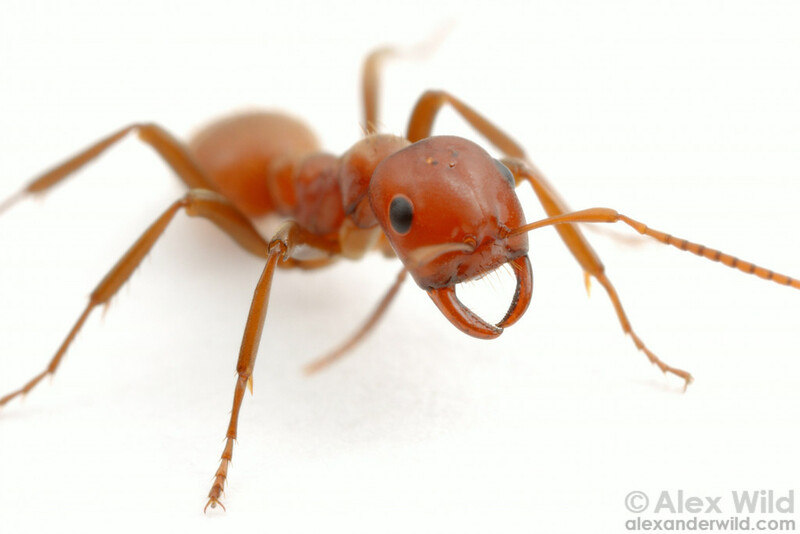 Ant slaves are generally considered as poor helpless sods, being unable to do anything about their sad situation. However, this turns out to not always be the case! Enslaved Temnothorax workers rebel against their slavers in a unique and sneaky way. Instead of fighting against their slavers directly, they instead destroy up to two thirds of the female slaver eggs and pupae. 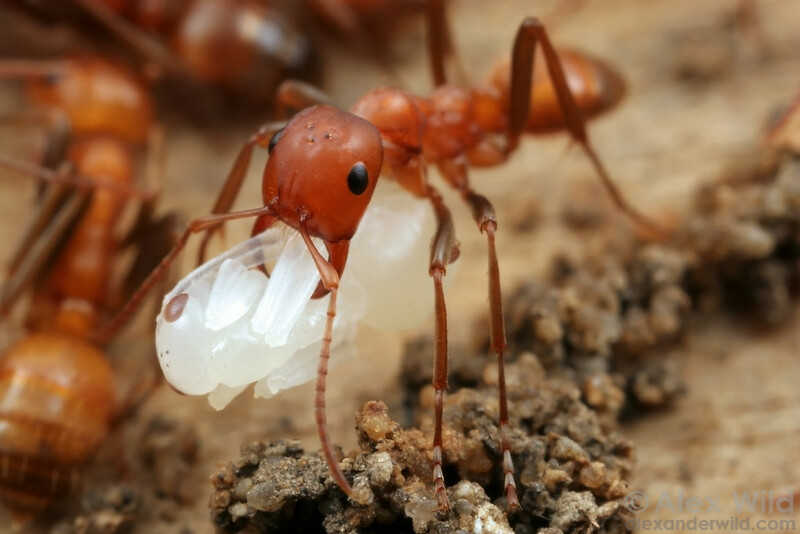 By doing this, the slavers produce much less queens and workers than they normally would, and thus have much less of an effect on surrounding colonies of Temnothorax. In other words, by making sure their slavers are less successful, the slaves make sure that other colonies around them have less chance to be enslaved or raided. Since many of these surrounding colonies are family of the slaves, the slaves are still indirectly passing on their genes to the next generation.